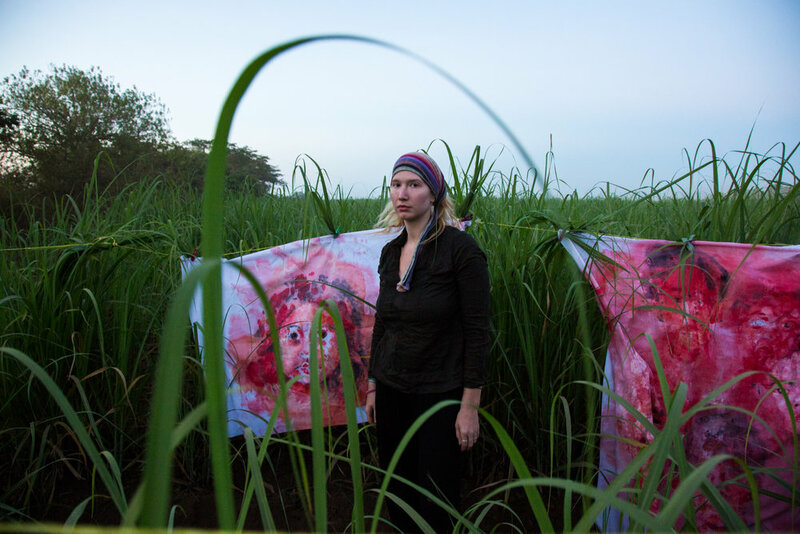 In Chichigalpa, Nicaragua, in collaboration with La Isla Network, Aubrey Roemer documented via painted portraiture the Chronic Kidney Disease epidemic killing sugarcane workers. The staggering mortality rate among the male workforce population from this disease is thought to be caused by a combination of dehydration, strenuous labor conditions, and environmental toxins. 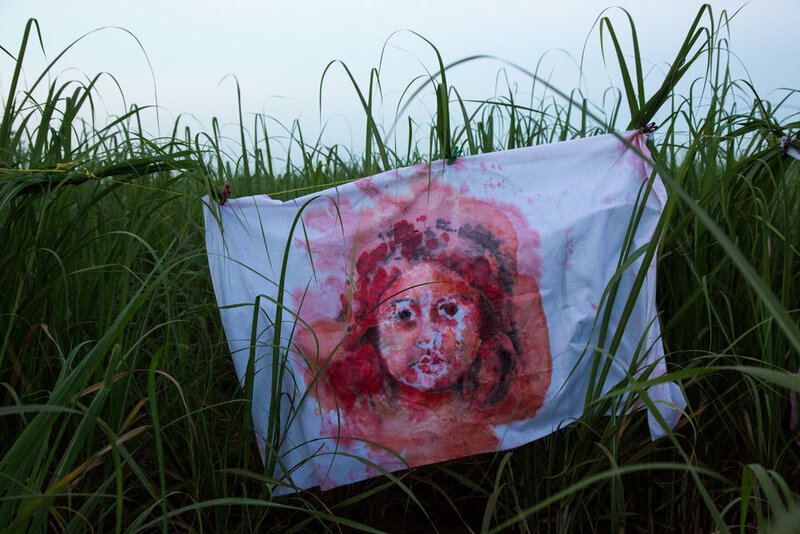 Painting in Chichigalpa, including the small community of “La Isla de las Viudas” (“The Island 0f Widows”) - a name reflecting the reality of life where many men are dying young, leaving behind their families., Images of entire families affected by CKDu are depicted on cloth protest banners were used in protest and installed in the sugarcane fields during the various stages of harvest. 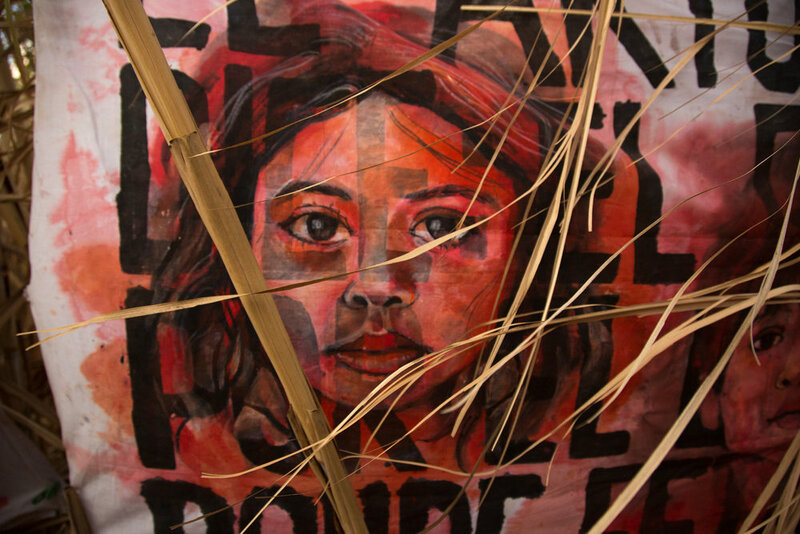 A series of memorial portraits have been created of those who lost their lives to CKDu, which were shown alongside the banners, were exhibited in a mass installation for the affected community in Chichigalpa in August 2016. After this final installation, all of the portraits were given back to the surviving family members. Each banner and portrait has a ghostly secondary monoprint that was created in the process of painting, which are exhibited and installed with the mother images. This work was driven by members of the community, La Isla Network, the scientific and medical research of many dedicated to intervention and advocacy for this disenfranchised group of workers. The project was documented by photojournalist and filmmaker Tom Laffay who lived and worked in this region for four years dedicated to the issue of CKDu there. In collaboration with photojournalist Ed Kashi, who has also documented extensively this issue, Roemer, Laffay and Kashi are exhibiting the work which is set to travel the world raising awareness. So far, the group’s work has exhibited at the Bronx Documentary Center and the University of Vermont. Empalagoso was also brought to K.A.T. Sugar Refinery Artist Village in Taiwan where it was worked on and exhibited on the grounds of the Taiwan Sugar Museum. In touring the work, there is hope to educate members of the consumer culture to the devastating costs of sugar production in an increasingly global world. View Aubrey Roemer and Ed Kashi’s personal websites linked here.